The Treasury of National Jewels Museum is probably Tehran’s biggest tourist draw card, it houses a collection of the worlds most expensive jewels collected over centuries. But while the museum highlights a vast civilization, it also reflects on the "silent tears" of the Iranian people from bittersweet memories to victories and constant battles with corruption. Every piece bears testament to the long and tumultuous history of the nation. You may read stories and see photographs, but nothing will do it more justice than coming to gawp at the real thing. However before you come, it's important to reflect on Iran's heavy history, to understand the purpose of the jewels in the past. Most of the collection in the National Jewelry Museum of Tehran dates back to Safavid-era, as they conquered neighboring empires and drew them back into Persian heartlands. The Safavids scoured for jewels and struck private deals between Ottoman and Indian lands, collecting ever more booty to decorate their capital of Isfahan city. But when the Safavid empire crumbled the vast collection became one of the highest profiled spoils of war. First Mahmud Afghan invaded Iran in 1722, he plundered the treasury and sent everything to India. Until 1736, when Nader Shah Afshar ascended to the throne, he sent messengers to India to request the safe return of the jewels. When his powers of persuasion couldn't meet the task, Nader Shah sent an army in 1739 to convince them instead. To get the Persian Armies off his back, Mohammed Shah of India was obliged to return the "Darya-i-Noor", and the "Koh-i-Noor" diamonds (Persian for 'Sea of Light' and 'Mountain of Light" respectively), in addition to the infamous "Peacock Throne" and other assorted treasures. It is estimated that the total worth of the booty came to roughly £87.5 million sterling at the time, or approximately £12.5 billion in today's money. The riches were so monumental that Nader Shah proclaimed to eliminate all public taxes in the empire for three years. Well stability didn't meet his generosity, because after Nader Shah was murdered in 1747 the empire collapsed badly. The Treasury was once again plundered and dispersed, but this time by none other than Nader's General of Khorasan, Ahmad Shah Durrani, who would later became the Emir of Afghanistan. Ahmad expanded the Afghan Empire through Persia, Bukhara, and India, eventually putting Afghanistan at odds with Britain's East India Trading Company. The "Kuh-i-Noor" (the world’s largest cut diamond), found its way into the sticky fingers of the colonial British and has been locked up in the Tower of London ever since. While the Peacock Throne disappeared and most likely was dismantled and sold off during the commotion. Do you have a headache yet? Well despite the setback, the Qajar and Pahlavi rulers enthusiastically added to the treasury collection ever since the 1800's. It eventually grew so large that by 1930's it was transferred to the National Bank of Iran (now the Central Bank of Iran) to bolster the national currency reserve. After all the turmoil settled, the National Jewelry Museum opened to the public in the 1990's. The purpose of the museum is not only to promote Persia's rich civilization, but also provide historical lessons of those who pursue power and hoard wealth. If a strong man should take five stones, and throw one north, one south, one east, and one west, and the last straight up into the air, and the space between filled with gold and gems, that would equal the value. The Central Bank of the Islamic Republic of Iran now maintains the collection. Once you arrive at the bank, just walk past it's front doors and into the heavy vault. Try to pick up a guidebook (stocks permitting) at the ticket entrance. Or join a regular and professional tour in English, French, German or Arabic – it’s included in the ticket price and worth the wait as detailed descriptions are not available. Getting there: Arrive at Sa'di or Ferdowsi Metro and walk from there. Prices: admission US$5, no under 12s. Gold Decanter: The gold decanter with it's outstanding enamel work contains pictures of flowers and birds. On the upper half are pictures of women. This decanter is considered one of the best examples of Iranian enamel work. Pair of Candlesticks: The golden candlesticks were decorated with spinels, diamonds, emeralds, rubies, tassels of pearls and emeralds. It was used as a twin display on either side of the Peacock Throne (Sun Throne) during ceremonies in the Golestan Palace. Ostrich Egg Shell Water Section of a Nargile (Water Pipe): The coconut shaped jar of a waterpipe is made of a beautifully carved ostrich egg shell. Turquoise and Ruby Water Section of a Nargile (Water Pipe): Parts of a waterpipe completely set with turquoises and rubies in spiral form. Made in Iran, second half of 19th Century). An Aigrette (Hat Ornaments): This aigrette is encrusted with various precious stones. Made early 19th Century. Aigrette: Made in the second half of the 19th Century. Ruby Cup: Ruby cup of the most delicate workmanship. Table Decoration: A little globe decorated with rubies. Coronation Cloak: This coronation cloak is made of hand woven silk with a white background and colorful paisleys. The border has a 6 centimeter peals and gold embroidery. This cloak was prepared for the coronation of Reza Khan Pahlavi, and was used again in the coronation of Mohammad Reza Pahlavi in 1967 AD. The weight of the pearls used is 1688 g (quite heavy alone). The present throne, although named after Nadir, has no relationship to him whatsoever. There are persuasive evidence that is was constructed during the reign of Fath-Ali Shah (1798-1834 A.D.). The panels, located around the seat of the throne, contain inspections which attribute the construction of the throne to Fath-Ali Shah. The motive of Fath-Ali Shah in having this throne made was to display pomp and splendor, as well as to foreign envoys who visited the king in various summer residences around Tehran. For this purpose, the throne is composed of 12 separate parts. The amount of precious stones amount to 26,733. This throne was used in the coronation ceremony of Mohammad Reza Pahlavi. Hat used by Abbas Mirza: The hat of Abbas Mirza, in the shape of a crown, is made of red satin and velvet cloth that has been sown with perles and gold sequins. On top is a large emerald set with diamonds. This hat was worn by Abbas Mirza, crown prince of Fath-Ali Shah, on official occasions. Made in Iran, early 19th Century. Three Brooches with Pearls: Three brooches with large pearls. The duck has a black pearl and the swans have white pearls. Made early 19th Century. Tiara: This Tiara was used by Farah Pahlavi with 294 diamonds and 7 emeralds. Made in 1958. Rare Buckler: The shield of Nadir Shah is made of rhinocerious hide. It was used with the war with India in 1739-1740 and the huge rubies, diamonds, spinels, and emeralds were later added to mark the occasion. Bottle: Golden rose-water sprinkler enamelled and set with rubies, diamonds, and emeralds. Crown used by Reza Khan and Mohammad Reza Pahlavi. This crown is made of gold and silver, and decorated with diamonds, emeralds, sapphires, and pearls. The fabric of the crown is red velvet. On the four sides of the crown are battlement designs and also sunbursts on the four panels, totally set in diamonds. The general design is in the style of the crowns of the Sassanid Kings (226-651 A.D.). Inside the front sun design, there is a very large yellow diamond. The total number of precious stones set in this crown is a follows 3,380 Diamonds (1,144 carats), 5 Emeralds (199 carats), 2 Sapphires (19 carats), 368 Pearls (perfect matching). Total weight of the crown is 2,080 grams. 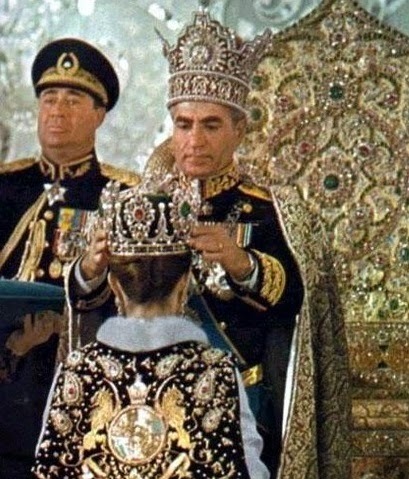 The crown used during the coronation of Qajar kings was the Kiani Crown, but Reza Khan Pahlavi did not use it. In 1925 AD, a group of Iranian jewellers, under the supervision of Haj Seraj-ed-din (famous jeweller for the Amir of Bukhara, had emigrated from Russia to Iran), undertook to make this crown, using select stones from the Treasury. This crown was used in the coronation of both Pahlavi kings. The famous Darya-i-Nur or "Sea of Light" is the largest pink diamond in the world and takes the first place among the National Treasury of Iran. The Darya-i-Nur diamond was inherited by Shahrokh Mirza, the grandson of Nadir Shah. It then came to the possession of Amir Alam Khan Khozaimeh, and later, Lotf-Ali-Khan Zand. Eventually Nasser-ed-din Shah of Qajar-era possessed it, believing that this diamond was one of the gems decorating the crown of Cyrus the Great (558 to 529 B.C. ), so was very fond of it. He wore it as an aigrette. The weight of the Dayra-i-Nur is approximately 182 carats, and it's color is pale pink, one of the rare colors for diamonds. The frame is set with 457 diamonds and 4 rubies. In 1965, an interesting discovery was revealed by Canadian researchers. The famous French jeweler and traveler, Tavernier, documented that he saw a large pink diamond weighing 242 carats, in the East, in 1642. He named it "Diamanta Grande Table." The Canadian researchers believed the Darya-i-Nur and Nur-ol-Ein were originally one stone. That the Grande Table stone got split into two stones, the Dayra-i-Nur and 60 carat Nur-ol-Ein, both of which are in the Treasury of National Jewels. The Nadir Aigrette is set with diamonds and emeralds. The central emerald is cabochon and a very good color. 3 Drop emeralds hang from the aigrette. There are 7 diamonds studded plumes on this aigrette. At the base of two of these plumes, there are two flowers and at the ends, two emerald drops. On both sides of the central emerald and below the crescent, there are flags, drums, cannons, and spears. The tricolored flags have pale blue rubies and emeralds. The whole aigrette is set with very good, rose cut diamonds. Reza Khan Pahlavi often used this aigrette with weights 781 carats. It was made in Iran, 19th Century. Crown used by Farah Pahlavi: The crown used by Farah has been made using selected gems from the Treasury, by Van Cleef at Arpels in 1967. The crown is made of platinum, gold, and adorned with the following stones: Diamonds (1,469), Emeralds (36), Pearls (105), Rubies (34), and Spinels (2). The total weight is 1,480.990 grams. Kiani Crown: Crown of Fath-Ali Shah Qajar known as "Kiani Crown" and set with diamonds, emeralds, rubies, and pearls. The final red stone is Aurangzib spinel. This crown was made during the reign of Fath-Ali Shah, and was used by some of the succeeding kings. It is the first known crown made after the Sassanid dynasty. It was made in Iran in 1797 A.D. This globe of jewels was ordered by Nasser-ed-din-Shah. With the help of a group of Iranian craftsmen under the supervision of Ebrahim Massihi, it was made from 1869 A.D. Loose stones from the treasury were used totaling 3,656 grams, while the net gold used was a whopping 34 kg. The total number of stones used is 51,366 pieces. Finding the different countries can be challenging due to the sparkling of the gems, but it's not so hard to spot the important countries. Oceans and seas are emeralds, lands rubies, and SE Asia, Iran, Britain and France diamonds. India is shown as pale rubies, and Central and South Africa sapphires. The equator as well as other geographical lines are diamonds and rubies. The diameter is about 66 centimeters, and the wooden stand is studded with gems. During the reign of Fath-Ali Shah and by his order, a great throne was made under the supervision of Nazemoldoleh Mohammad Hossein Khan Sadr Esfahani, the governor of Esfahan. Gold and loose stones were used from the treasury. The design incorporated a sun encrusted with precious stones at the back of the throne, hence "sun throne." This is not the genuine "Peacock Throne" plundered from India, this is the new Peacock Throne. Afterwards Nasser-ed-din Shah loved the throne so much, that he ordered it to be 'repaired' and small panels were added with inscriptions to document the work. What do you think of the National Jewelry Museum? Leave your comments below.